Authentic leadership is to be open with your followers about who you are and what you bring to the table in terms of strengths and weaknesses. For Brett Hooks, ’17, this quote has truly impacted his understanding of what it means to be a leader. As project manager of retention and development for Walmart US Supply Chain, the sustainable supply chain management grad is responsible for the training and development of new associates at Walmart’s Opelika, Ala., facility. 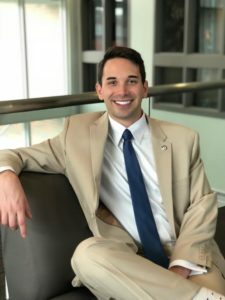 His numerous leadership roles during his time at Louisiana Tech — including serving as Treasurer of the Student Government Association and as a College of Business Ambassador — along with his business courses allowed him to hone those leadership skills. Along the way, he has also learned to be a critical and strategic thinker — two qualities he noted are some of the most important gained during his time as a student. Hooks learned to provide reasoning and data for his answers, and uses that skill daily in his current role. In addition to his training and development duties, Hooks is also tasked with reducing turnover and increasing associate retention and morale, a project valuated at $2,200,000 at his facility and nearly $100,000,000 company-wide. The DeRidder, La., native also works with the continuous improvement team to drive standard processes for training that are being used throughout Walmart U.S. Supply Chain. This team of management consultants mentor Hooks in the practice of lean principles at the largest company in the world.